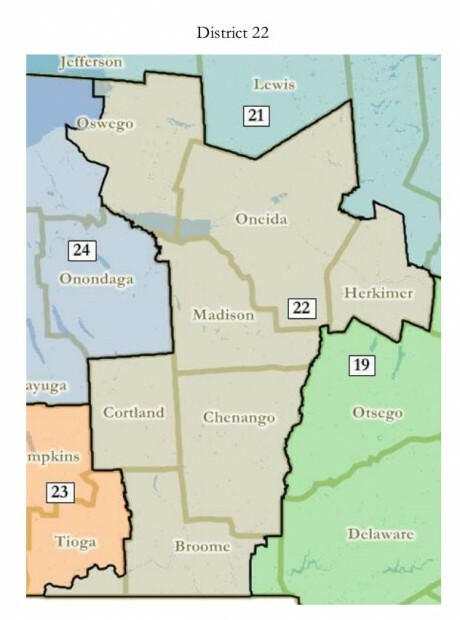 The redrawn Congressional map of Upstate New York, showing the splitting of Oswego County between the new 24th and 22nd Congressional Districts. No matter what happens in November’s elections, Bill Owens will no longer be Oswego County’s representative in Congress. 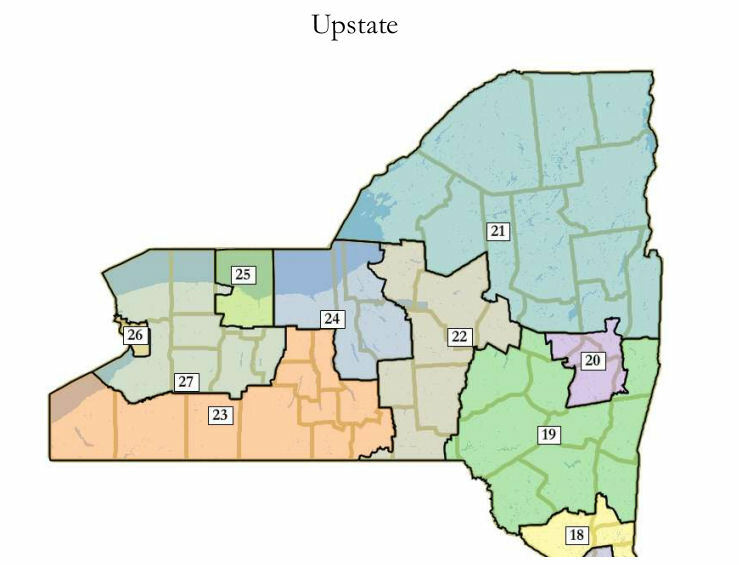 That’s because a federal magistrate’s plan to redraw district lines across the state has taken Oswego County out of Owens’ district and split it between two other members of Congress. 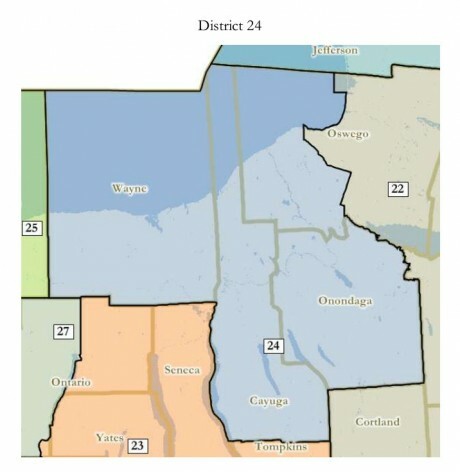 The new 24th Congressional District, which included the western half of Oswego County as well as all of Onondaga, Cayuga and Wayne Counties. 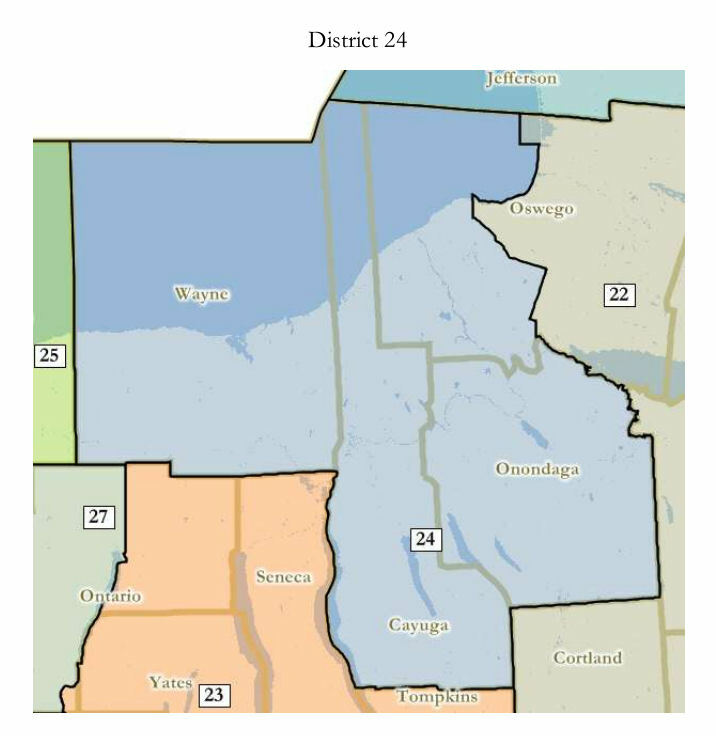 The western half of the county, including the cities of Oswego and Fulton, will go into a reconfigured 24th Congressional District. Republican Ann Marie Buerkle represents that district and is running for reelection. She faces the winner of a primary among Democrats which includes the man she beat by a very small margin two years ago, former Congressman Dan Maffei. The new 24th covers all of Onondaga, Cayuga and Wayne counties in addition to the portion of Oswego County. The new 22nd Congressional District, which covers all or part of eight counties and stretches from Pulaski to the Pennsylvania border. The new map shows the eastern half of the county, which appears to include Central Square, Mexico and Pulaski, moving into a reconfigured 22nd Congressional district. The current office-holder is Republican Richard Hanna of Utica. Hanna’s district would stretch from Pulaski south to the Pennsylvania border. Owens would see his district focus on the counties that make up the Adirondack region. A federal magistrate redrew the Congressional lines because the state Legislature failed to do so by a deadline. Each political party in the Legislature came up with a map for Congressional districts, but could not reach a compromise. They must still come up with new district boundaries for State Senate and Assembly districts. There appears to be agreement on those boundaries and Governor Cuomo has reneged on his often-made promise to veto any lines drawn by anything other than an independent commission. Cuomo went back on that promise after striking a bargain with both parties on a host of other legislation. District lines are redrawn every ten years, after the U. S. Census, to reflect shifts and losses in population. New York will lose two seats in Congress as a result of a shrinking population.